I love Valentine’s Day. I know I may be in the minority here, but I do. Even the years I didn’t have a significant other I loved celebrating love. I’d buy the cheap cardboard valentines and hand them out in my school classes along with delicious candy for everyone. I did this well into college…seriously. I would have girls’ night with my friends almost every year where we would order Chinese and watch romantic movies and enjoy the love and bond we shared as women and friends. I love me some love. 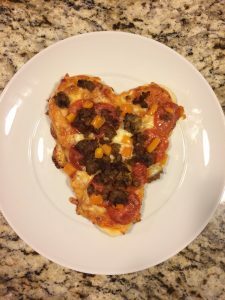 The tradition of Valentine Pizza started after I got married. It was something we both loved, and it was a cheap way to spend a night in, instead of fighting the crowds. When it was the two of us I would make one big heart shaped pizza (which is easier). 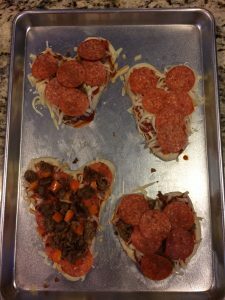 Now that we have kids I let them make their own individual pizzas, and they love helping me in the kitchen. Do I usually make my pizza dough from scratch? No. Can you? Sure. 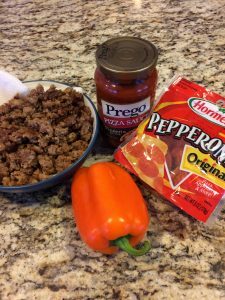 Slow cooked pizza sauce? No. But feel free. The beauty of this meal is that it’s simple, festive and delicious all at the same time. Pair it with a yummy salad (no judgements if it comes from a bag), and you are set. 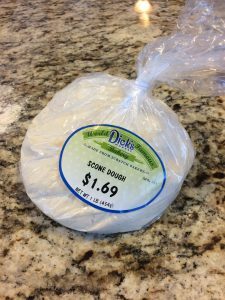 I start with a scone dough from my local bakery, but a yummy refrigerator dough from your grocery section works great too. 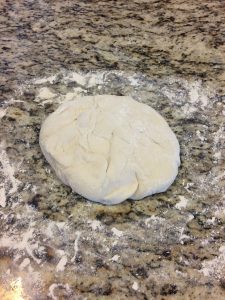 Spread a little flour on the counter to divide and roll out your dough. 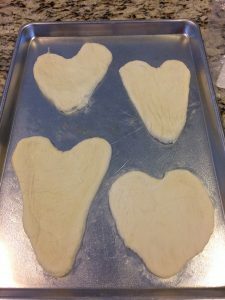 Here is where I let the kids help me shape their dough into a heart. Can you tell the ages of those shaping hearts? It can be trickier than you think. Be sure to grease your baking sheet. 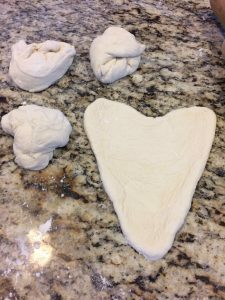 Bake your dough at 400 degrees (or according to your doughs instructions) for 7-9 minutes before adding your sauce and toppings. This keeps thick crust from getting soggy and gives it a heard start to bake. Our variety of toppings gets less fancy every year as the kids develop aversions to anything green or exotic, but we do sometimes do BBQ chicken toppings as well. Feel free to be creative and go crazy with your toppings- Thai pizza, fresh herb pizza, margarita pizza, gorgonzola, pear and balsamic reduction!! Really the sky is the limit, especially if you are shooting for fancy. When you’re done topping your pizza pop them, or it, into the oven for 20-23 minutes (or according to your dough package instructions). The scone dough makes a thick crust, but if you’re going for a thin crust try starting at 15 minutes bake time. Don’t be afraid to let your crust turn a gold brown, you don’t want a doughy crust. What about dessert? We usually let the kids pick a dessert, but when the kids go to sleep the adults break out the fruit and chocolate or our favorite fancy gelato. 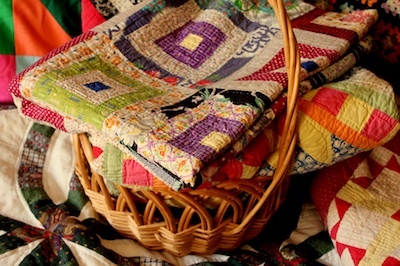 It’s the perfect end to a fun, hassle-free, family Valentine’s Day. Be loved friends! I am divorced. 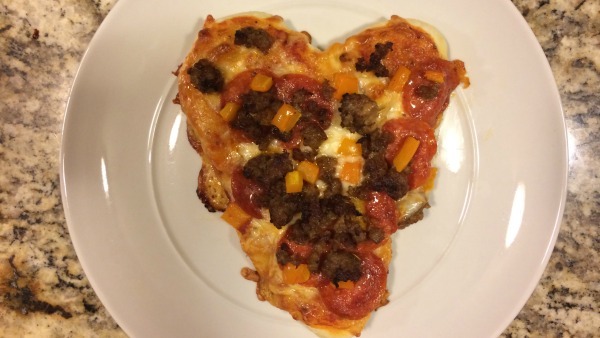 I make myself a Heart shaped pizza for Valentine’s Day. It is just something that I enjoy doing. I feel that I am celebrating….even though I am alone. A couple of Easters that I was by myself, I made an Egg shaped pizza. I guess that you can see that I love ? pizza….too!